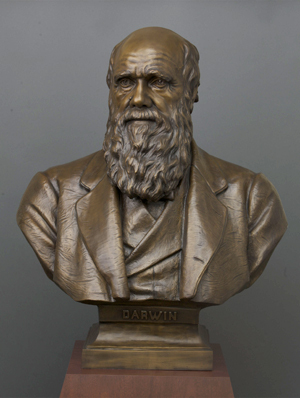 To commemorate the bicentennial in 2009 of Charles Darwin's birth and the 150th anniversary of the publication of "On the Origin of Species," the National Academy of Sciences commissioned a replica of a bust of Darwin created by Virginia sculptor William Couper (1853-1942). The original bronze was commissioned by the New York Academy of Sciences (NYAS) in 1909 and was given to the American Museum of Natural History to inaugurate its Darwin Hall of Invertebrate Zoology. The original bust has since been returned to the offices of the NYAS where it resides today. A replica was cast by Couper in 1909 and given to Christ's College, University of Cambridge, where Darwin studied. The March 1909 issue of The American Museum Journal stated that "The bust is pronounced by those who knew Darwin personally and by his sons in England... the best portrait in the round of the great naturalist ever made." The process used to reproduce the bust of Charles Darwin for the National Academy of Sciences combines traditional techniques with innovative digital technology. A virtual model was created by scanning the original sculpture in situ at the New York Academy of Sciences, which graciously consented to the creation of a second replica. Using a rapid prototype process, a form was created from which a bronze was cast. This process reduced the potential of damage to the original and gave artisans more flexibility in refining the details of the final work.